Geek Montage is now releasing its next game! Behold, Fish and Chips! You must eat fish smaller than you to grow and prosper! 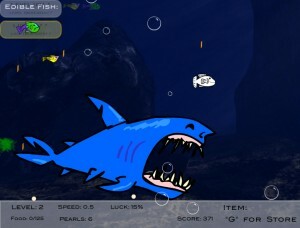 See the full description, get access to special fish, and cheats here. What are you waiting for fool?!!?!? Go ahead and play Play Fish and Chips! This entry was posted	on Monday, March 5th, 2012 at 7:08 PM	and is filed under Games. You can follow any responses to this entry through the RSS 2.0 feed. You can leave a response, or trackback from your own site.